I am sure we could work something out... Were you interested in a DIY hunt, or coming to my camp ? Aw man I dont care I just want to hunt Elk! Diy...Camp with some new freinds....im game! Stiknstring...post up some pics bud! love to see how you all out in Washington do it out there! shut how do you guys deal with all the rain....guess you need some good rain gear hu? Actually, after living here all my life, I really don't use raingear until late season. I spray my regular hunting clothes with "Camp Dry" and change footwear frequently, and go through a LOT of socks. seems as long as my feet are comfortable, I am fine... A little moisture in the air helps keep me cool while struggling through all the blowdown, and climbing up out of drainages. 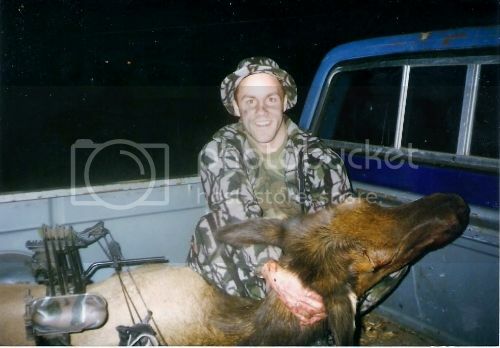 Only animal to hit the ground last year from our camp was by Matt Brody from Wisconsin. 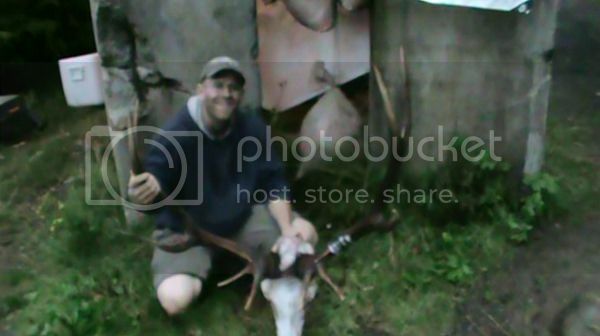 Using a longbow he made himself, and hunting on his own behind one of the gates..
that is AWESOME bud!!! Id shoot that bull in a sec. Ya I hear ya on the feet...my feet like a good pair of boots and some good socks! Im going to have to check out that 'camp dry" stuf!! It is like scotch guard, aerosolized silicone. Dries odorless. I spray several light coats on my clothes while hanging. Actually, whenever I get new camo, I wash in Sport Wash, then treat with U.V. Blocker. Then spray several very light coats (I think this is key) of camp dry. With very light coats you don't affect the breathability of the fabric. That way I can hunt in regular clothes and avoid having to wear a heavy jacket in T shirt weather. mostly though, you get wet from the bushes, the "rain" itself is like a mist and leaves collect the moisture. Pantlegs get soaked walking through 3-4 foot ferns, while the canopy of the trees filters the rain. back to the good boots and socks. One of the weird things about Roosevelt Elk, they like where they are, and can go 100 yards through the crap, stop and watch you attempt to go 10 feet. I still sometimes bounce of the bushes a few times myself. But the ones near active roads don't talk as much, too many idiots with "Hootchie Mommas"
I like to have a quick breakfast, grab my gear, drive to a gate before daylight and hunt all day, usually walking out in the dark, drive to camp, fix dinner and listen to stories. If they have some good ones, I'll spend a day checking out their spots... I alternate days. But elk that live by active roads are smart, very hard to get shots at. I like to get away from active roads and other hunters, because talking to elk is my favorite thing. I get more out of calling an animal in to me than I do out of actually getting a shot. An "alligator bull" will give you a shot of adrenalin that you will never forget ! Or having some back and forth vocalizations as it comes closer... I LOVE ELK HUNTING IN SEPTEMBER !! 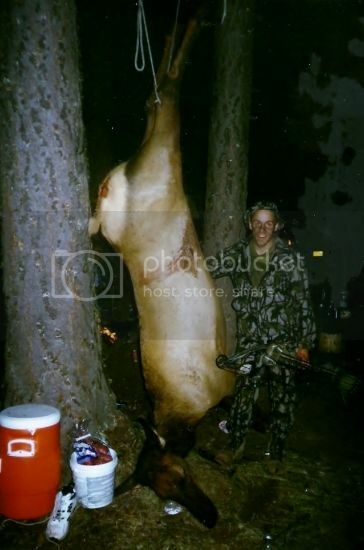 This is what a cow elk looks like !! Scott Samuels got lucky (we all did) by getting this one near a road. 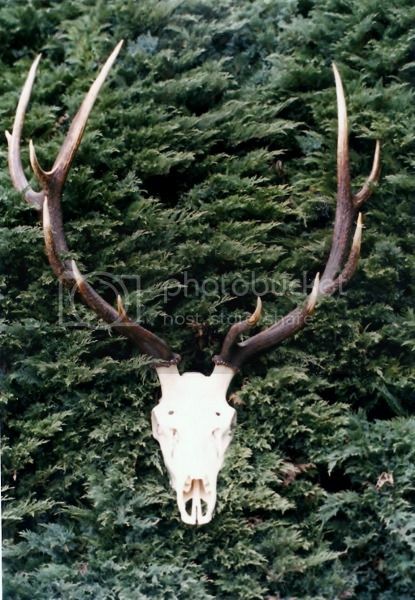 Here is a European of my 5X7 , 242" 5/8" Roosevelt.